Leaf is a start-up company, originating from Costa Rica. Their product is an iOS free mobile application that plays, collects and shares the app user’s favourite tunes. It allows the user to sign up to artist-curated sets and to share and create their own. Leaf integrates with Facebook, Twitter, and Tumblr to post music updates. The app features over top 100 songs from the Billboard (USA). The company encourages established and unsigned artists to sign up to share and sell their own music directly through the app. The client was had their own stand at Web Summit 2014, a tech conference which has been attended by 22,000 delegates, which include 3,000 start-up companies and 1,500 journalists. The event was to take place in Dublin and for this, Leaf.FM needed two different coloured T-Shirts printed for their team to wear at their stand. The T-Shirts chosen were white and green and required a single colour print. 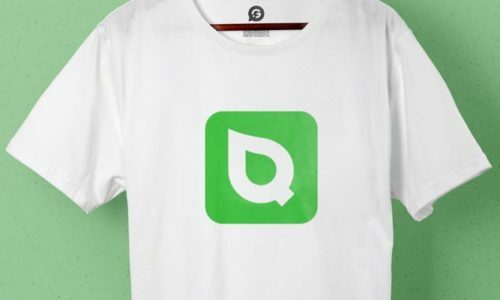 The print was the company’s logos on the front of the T-Shirt, on the white T-Shirt there would be a green logo and on the green T-Shirt, the logo would be white. We opted to use our Gildan promotional merchandise T-Shirt range as it offered excellent comfort for the user as well as providing perfect print quality. For the printing, we opted to use a 1 colour Cad Cut Vinyl print as it would allow us to replicate the logo perfectly and it also meant that we could have the T-Shirts printed and with the customer with a quick turnaround.